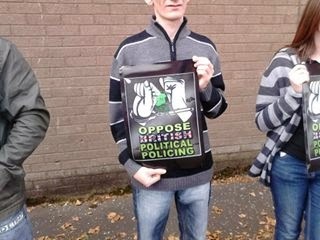 Belfast 32 County Sovereignty Movement: Protest outside Antrim Road RUC/PSNI barrack. 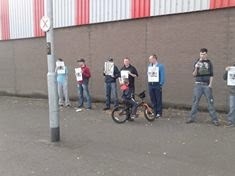 Protest outside Antrim Road RUC/PSNI barrack. 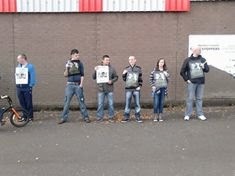 Belfast members of the 32csm held a protest outside Antrim road barrack to highlight the on going harassment of political activists by the British war machine here in Ireland and abroad. Agents presumably from mI5 or special branch made numerous approaches to one of our members while he was on a holiday with his family last week. 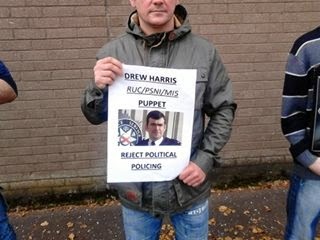 We see this as a blatant attempt to try and recruit him to become an informer and when they failed, they just set about to try and destroy the families holiday. 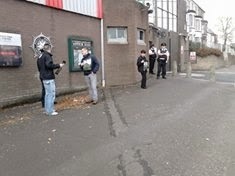 We would strongly advise anyone being harassment or intimated by the security forces to inform a friend or family member and get in touch with their solicitor. If the brits think you are feeling pressure they will keep on till they get or break you. We would also like to ask Marty the British puppet to take a look out from his castle and tell us all that his pay masters war is over.